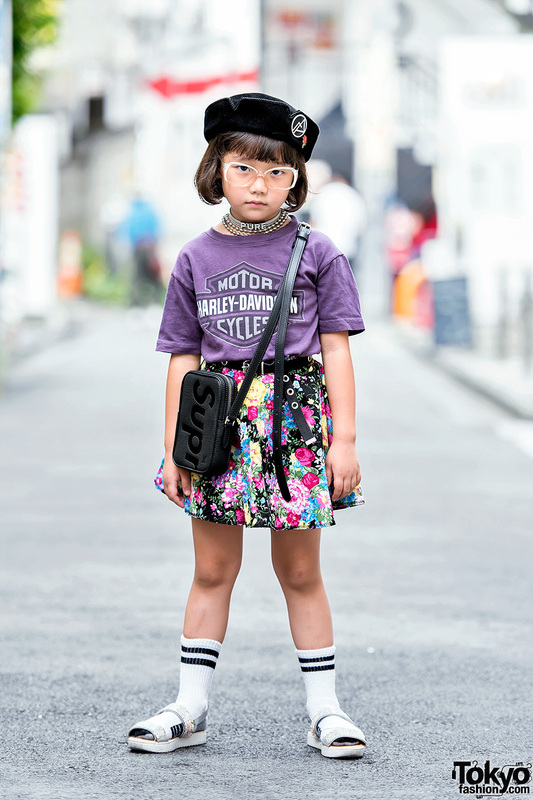 6-year-old Japanese street style personality in Harajuku wearing a vintage tee, vintage glasses, vintage hat, floral skirt, and sandals. Harajuku girl with pink hair wearing a minidress with platform sandals, a heart choker, and playing card clutch bag. Harajuku designer with pink hair & glasses wearing a maxi dress with a white tote bag, handmade earrings & sandals with red socks. Harajuku stylist wearing cropped Fendi pants, round sunglasses, a quilted Chanel bag, and sandals with socks. Harajuku girl with sequins cap, t-shirt and midi skirt, tote bag, rocking horse sandals with socks. Harajuku girl with short pink hair & dyed eyebrows wearing a sequined mermaid cardigan over a polo t-shirt and sports socks, with flower bag and socks with sandals. Colorful Harajuku decora girl with hair accessories, colorblock jacket, bows dress, rainbow over-the-knee-socks, wedge sandals and backpack. Harajuku girl in colorblock top and skirt with horns hat, hair accessories, teddy bear scarf, striped backpack, iridescent sandals with socks & plastic jewelry. Harajuku girl with bangs and half bun in a trench coat, kanji print dress, backpack and platform sandals with socks. Harajuku girl in vintage dress with gingham headband and purse, golden jewelry and socks with platform sandals.